The Norfolk Beaches Handbook is the “must have” book if you’re visiting Norfolk, or for that matter if you live in Norfolk. 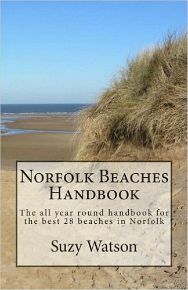 At long last here is guidebook with all the detailed information you ever need about the best 28 beaches in Norfolk. Which beaches are dog friendly? I know this is a really important question for many of you. Should you go to somewhere which has lifeguards? Very few of the Norfolk beaches have lifeguards, and with the fast flowing tidal waters, this is often a top priority if you’ve got children. Do you want to get away from the crowds? Maybe you want to get away from it all, there are certainly a few beaches which are empty more often than not. Which beaches have fun fairs and attractions and will entertain the kids? Would the kids like to go fossil hunting? One of the Norfolk beaches is a Site of Special Scientific Interest and was where the remains of 85% of a steppe mammoth were found! Would you like to go bird watching or seal watching? Both of these past times are really popular in Norfolk, so finding the right beach for these is important for you. What’s disability access like? 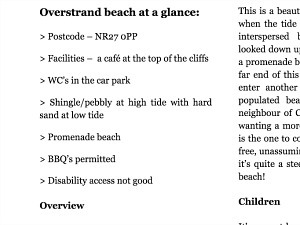 Some of the Norfolk beaches are definitely not good for disability access and you need to know which ones will be good for this. 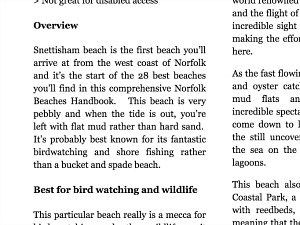 You can take a “look inside” the Norfolk Beaches Handbook to get more of an idea of what’s in store for you. Or you can read on if you want to know more about what this book can do for you! There is an “At a glance” section at the beginning of each beach which gives you a quick guide as to what to expect, before reading on for more detail. This means it’s very easy to see straight away if the beach is good for you and if it’s got what you’re looking for on that particular day. No more spending hours searching around on the internet for individual beaches, here you have it all in one place. You know what it's like trying to find something particular, but you have to keep searching and searching. You can spend that extra time enjoying yourself and relaxing on the beach, and everyone will be happy! There are also detailed sections with subheadings on each beach starting with an overview and then going on to talk about particular topics. It gives you a chance to really discover whether this is the ideal beach for you, as well as what’s on offer once you visit it. You’ll be glad that you’re more informed and can finally choose just what you’re looking for. The other great thing is that you can get your children to read through and choose a beach, making it more fun once you get there. See if they choose the right beach! At least they can’t complain and it all makes for a much more relaxed holiday! 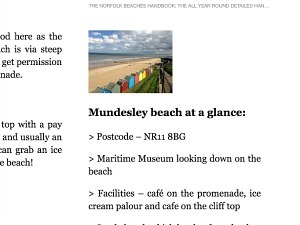 Don't forget, you can "look inside" the Norfolk Beaches Handbook for more of an idea from the Kindle version. There are even photos of each beach (albeit rather small ones on the Kindle version. I’d love to put in masses of photos, but unfortunately a downloadable book is not really an option for this). However, the paperback version has many more photos which are also much bigger in size, giving you an excellent idea of what you can expect to see from the beach you choose to visit. It gives you an idea of what each beach or surroundings looks like and will enable you to make a decision on whether it will be a good choice for you. It’s always nice to know a little bit of what to expect, leaving you happy and relaxed before you get there. 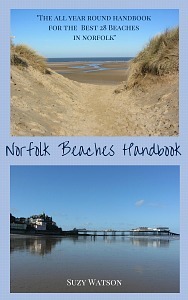 Why not take a “look inside” the Norfolk Beaches Handbook here. You've got a choice! There's a paperback version which is excellent for carrying around with you, or leaving in your car, or there's a Kindle version. So many of us are now using tablets and phones to search on the internet and keep all our belongings on them too! You don't need a Kindle to read this book. If you have a tablet or smartphone, you can download the Kindle App and read it from there. This book will mean you’ve got it at hand if you decide to change your plans for the day or you're sitting in the evening working out where you're going the following day. If you go for the Kindle version, it also means that you can be safe in the knowledge that it’s not sitting on the forgotten pile left at home. Phew! It’s a great handbook for both first timers to Norfolk and locals alike. 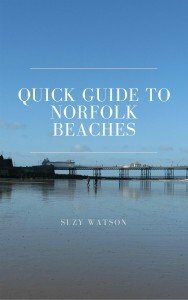 The Norfolk beaches are amazing at any time of year, so this all year round handbook will be useful whenever you decide to visit one of the beaches. It’s always fun to experience new beaches and to visit more of Norfolk that you perhaps didn’t know. It’s exciting and different, and something that you can recommend to others, unless you don’t want to give away your secret beach! Written by a Norfolk local! Yes, I do live in Norfolk. 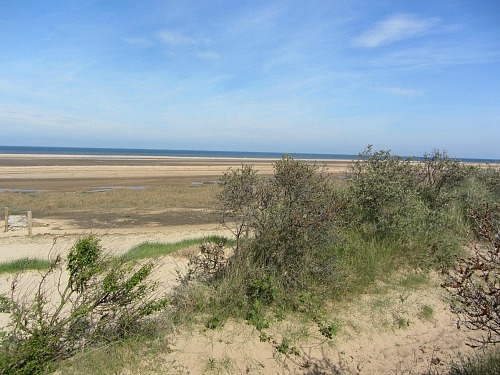 To write a book like the Norfolk Beaches Handbook, you’d have to live in Norfolk to understand what each beach offers. I’ve lived in Norfolk for 24 years (which in Norfolk terms is not a long time!) so I know all the beaches and have been to them all, I use them all year round, some more than others. I’ve been to them when they have snow on them, when they have wind hurling along the sand, I’ve been to them in the rain and sun and fog, and taken my dogs too, oh and children! You can order the Kindle version of the Norfolk Beaches Handbook today, and don't forget you have the option of “looking inside” if you want to discover more about the book. Or you can order the paperback version of the book if you don't want the digital handbook.